On Sept. 13, 2015 we flew from Detroit to Anchorage; spent the night then flew to Cold Bay on the 14th. We were amazed by the beauty of the country we could see. 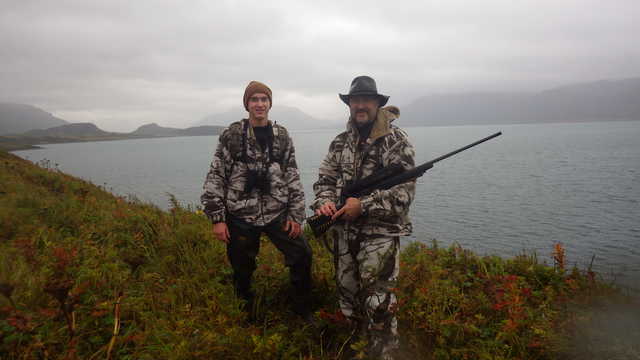 Once in Cold Bay, our outfitter picked us up and we flew into Bear Lake Lodge. We met Kat, the wonderful cook! She served us up a hot bowl of soup to tide us over until supper. 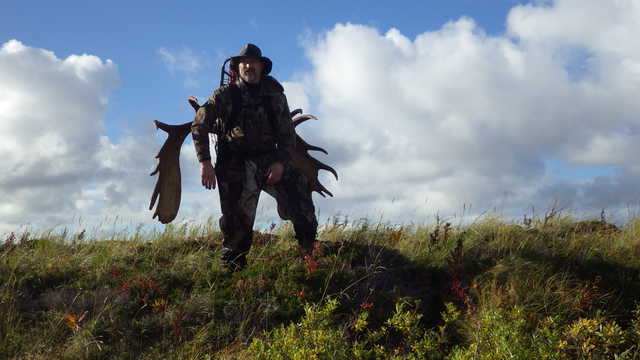 Next we met the other Moose hunter in camp, Gordon. Very Nice gentleman. 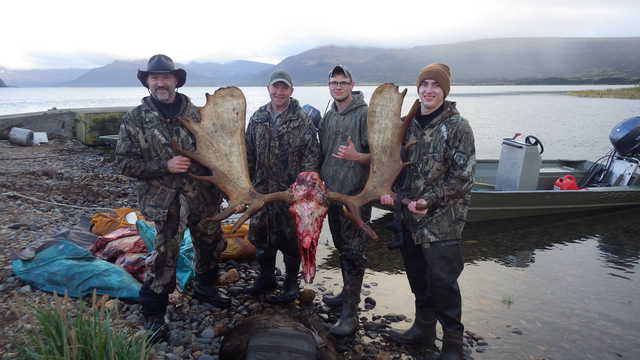 We also met, Nels- the resident Pilot extraordinaire; Tanner- tough, young man whose job was the "Packer"; Shane- a guide and Leo- my guide. 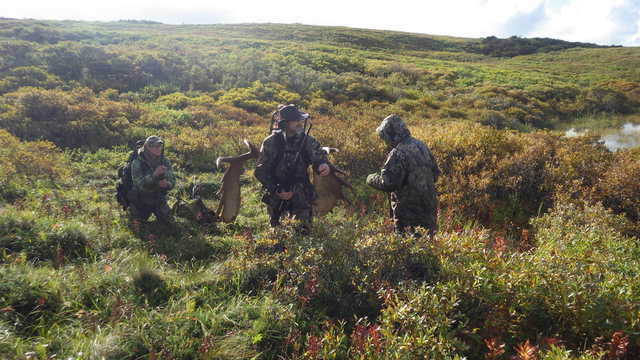 We did some glassing that afternoon and evening and spotted a few cows and calves, but no bulls. Also spotted a BIG Bear! They estimated he was 9-10 foot tall. Looked like a tank eating fish. 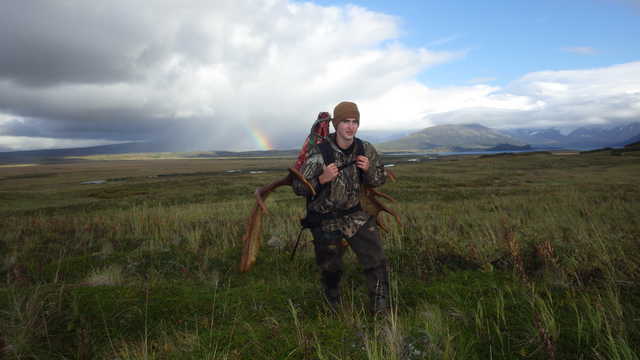 The next day was rainy, and we did a lot of glassing- but no bulls. We did some fishing in Bear River and was catching Dolly Vardens about every other cast. The fishing was incredible. The next morning, Kat got up at 4:30am and caught several Dollys and fried them up to go with our breakfast! That was awesome. 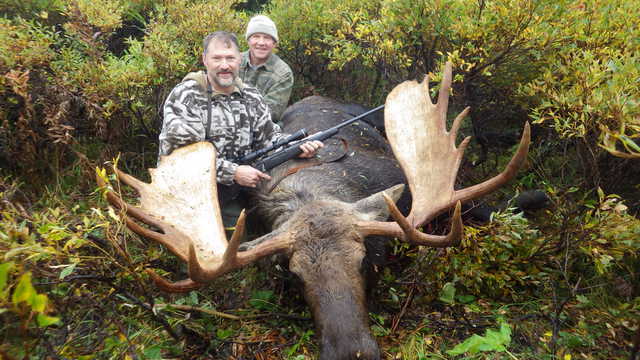 After the hunt, and packing out my moose, we had several days before we had to return to Michigan, so we rented an SUV and drove around Kenai, Homer, then up to Anchorage. 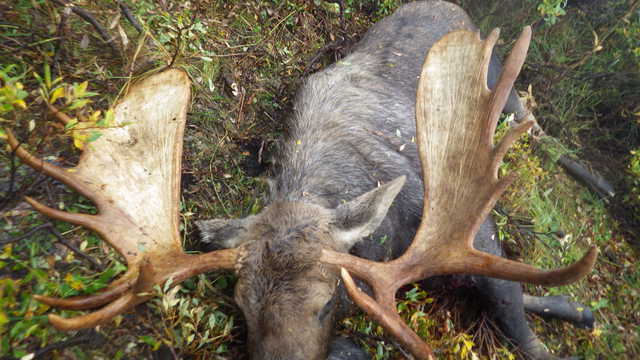 I put my moose on a freezer truck (Alaska Express) to ship him back to the lower 48. 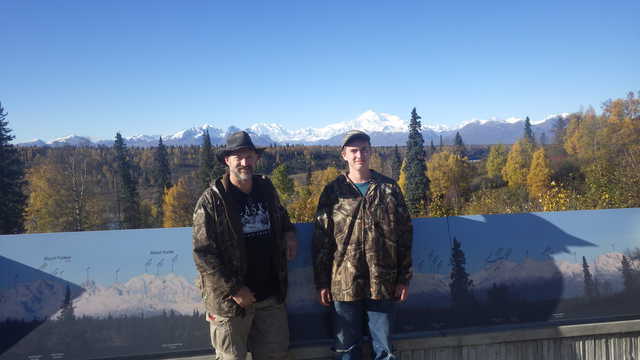 Then we drove up to Healy to see the Denali national park. We spent a couple days in Denali, saw dozens of Moose, Dalls sheep, Grizzlies, and wolves. Sept. 15th, On the crest overlooking Bear Lake. We went out for a morning hike to glass and see if we could spot a nice bull. It started raining and the fog was moving in. We were out a few hours and spotted a medium sized bull a couple miles away. We decided not to pursue him. Late afternoon on Sept. 15th. Second day of the hunt, and we spotted a bull. He looked good through the spotting scope, and worth getting a closer, better look. We hike nearly 2 miles across the tundra searching for him. The ground was uneven, hilly and a little spongy at times. Beautiful countryside. After a couple hours of hiking and glassing, we spotted him beside some alders. We got lots of video, but no pictures of him bedded down. Leo did some calling and got him to stand up. Now we could see the top 2/3 of his rack, and he looked pretty darn good to me. Leo said we needed to see the bottoms and wanted to get him to come out for a better look. After a little more calling (grunts), he started coming out. He raked a bush and tossed his big ol head around. He was coming in, and looking for a fight. I am watching him, thinking he looks pretty good to me, but also wondering if I should shoot the first bull I see. 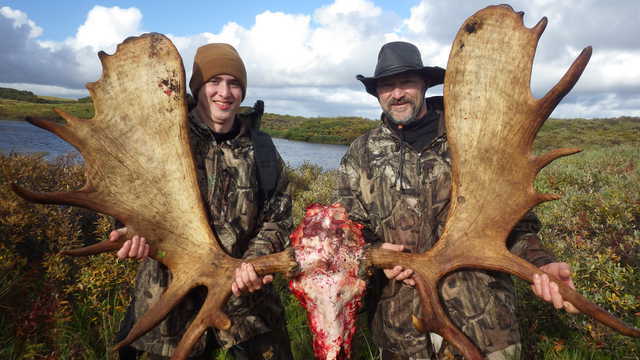 This was my first ever big game hunt, out of my home state of Michigan and I wanted to be sure he was really as big as he looked. Leo confirmed he was a good one. Game on! The Bull did his slow, methodical and stiff legged walk down out of the alders and into the brushy area. The underbrush was 3-4 foot high and up to his belly. I prepared for the shot, resting on one knee due to the height of the brush. It seemed like 10 minutes before he finally gave me a good clear shot. I wanted to be very certain his antlers were clear of his shoulder. When he stopped to pick up his head, I fired. I hit him hard in the front shoulder and he took a couple stagger steps forward. I racked anther round in the chamber, stood up full height and fired again, hitting him behind the shoulder. He swayed for about 1/2 second and dropped. My son Jameson got it all on camera too. We estimated he would weigh around 1500 lbs. 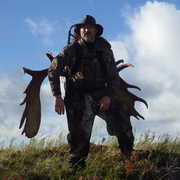 60" wide rack with 9 points on one side and 7 on the other! I was thrilled with him. My guide Leo and me. I named my bull: "Tantor". That is the name of Tarzan's elephant. The final load of packing him out. Jameson and I really wanted to be part of the packing out too. He is 17 and said that the packing out was second only to the actual kill, for the most enjoyable part. We took turns packing out the head. It was just under a 2 mile pack out to the boat, then another 1 1/2 mile ride up the river to camp. Tanner seemed to always have the heaviest pack. He was one tough young man, and there was not an ounce of quit in him! It took the four of us most of the day to complete the pack out. Tanner has the hide, which I intend to get tanned and sew me up a nice jacket out of. My wife thinks that a crazy idea, but I can't wait to get it back, and get started. Stay tuned. Trophy of a lifetime! Memories made that I will never forget. 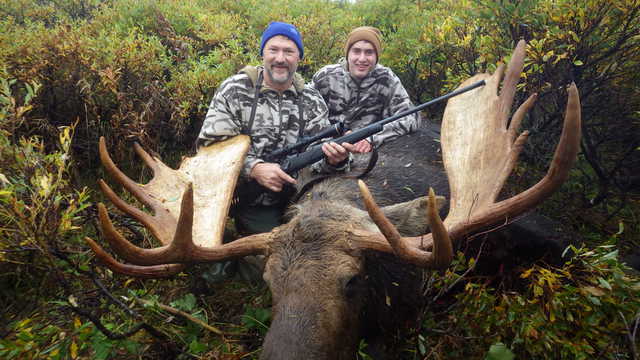 I would HIGHLY recommend anyone wanting to go on an Alaskan Moose hunt- take your son along! You will have the best memories and stories to share. Back at the Lodge, finally. It was a great day! Lots of hard work and one of the most enjoyable days of my life. In order from left to right: Bill (me), Leo, Tanner, and Jameson (my son). On our drive to Denali. AMAZING! I did wear other hats, that was just my favorite. 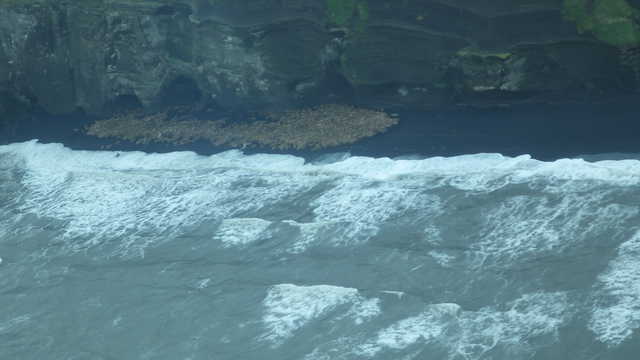 Flying from Bear Lake back to Kenai, we flew over this congregation of Walrus. I would estimate 300-500 of them. Great story!!! Thanks for sharing!